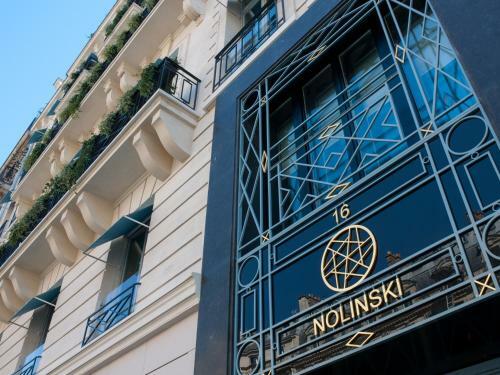 Nolinski Paris is set in the 1st arr. District in Paris, 500 metres from Tuileries Garden and within easy reach from the Rue du Faubourg Saint-Honoré shopping area. This Parisian 5-star hotel features a spa with a pool, a sauna, a hammam and massage rooms. The bright and spacious rooms and suites of Nolinski Paris are fitted with fine bedding, spacious wardrobes, plush carpets and rich curtains, and feature an elegant desk. Bathrobes and slippers are available for your comfort. 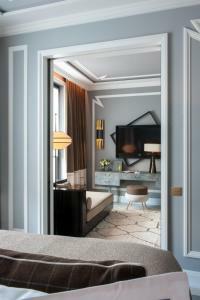 Some rooms offer windows and balconies opening out onto the heart of Paris. This double room has a private entrance and soundproofing. It also features an iPod dock and laptop safe. The mini-bar provides typical French and Parisian products. The private bathroom offers toiletries specially designed by the property. For your comfort, a personal smartphone with internet access and unlimited international phone calls is provided during your whole stay. An extra bed cannot be accommodated in this room. Rate: € 410.00 ... € 510.00; select dates below to get current rates. Rate: € 414.00 ... € 560.00; select dates below to get current rates. Rate: € 468.00 ... € 610.00; select dates below to get current rates. This suite has soundproofing. It also features an iPod dock and laptop safe. The mini-bar provides typical French and Parisian products. The private bathroom offers toiletries specially designed by the property. For your comfort, a personal smartphone with internet access and unlimited international phone calls is provided during your whole stay. Rate: € 648.00 ... € 880.00; select dates below to get current rates. Rate: € 900.00 ... € 1240.00; select dates below to get current rates. Rate: € 1654.17 ... € 1960.00; select dates below to get current rates. This family room has a private entrance, air conditioning and soundproofing. This room can be composed of connecting rooms or 2 side by side rooms. Connecting rooms are available upon request and are subject to availability.